We are looking for one motivated volunteer from Romania (18-30 y.o.) willing to go for EVS experience in Lithuania! Be a part of first scout campsite in Lithuania! Scout valley is the first scout campsite in Lithuania. It is located in the heart of the country near beautiful old city Ukmergė, 70 km away from other big cities – Vilnius, Kaunas, Panevėžys and Utena. It is a voluntary organization with the aim to become leading outdoor adventure education center in Lithuania for scouts, school children and youth. We are in close relationship with national Lithuanian Scout organization and Lithuanian Sea scouts. We are in the process to become members of international Scout campsite association “Goose”. Promotion of ECO sustainable living.. Scout valley is located in a small village Sukiniai. It is surrounded by beautiful wild nature, forests, lands and a stream. Only 8 km away there is a lake Žirnajai. We are part of active Eco community. Eco and environmental issues are very important part of our campsite. We generate our own electricity, use rain water, composting toilets, recycling and build sustainable houses. ► on the water (rowing, sailing, kayaking, rafting and team building etc.). 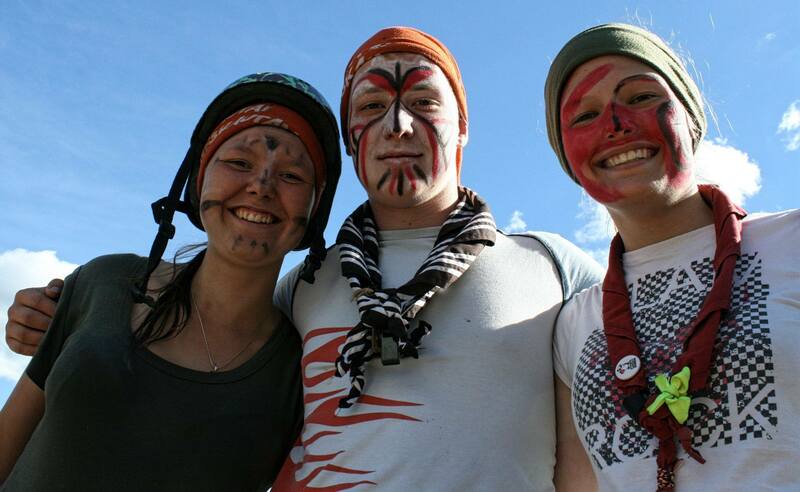 National Lithuanian scouting organization and organize their events, camps and projects. EVS volunteer will be part of all above mentioned activities. He/she will guide visitors and instruct them on the topic, prepare campsite and other activity zones, organize and search for new hike routes. New ideas and experience are very welcome! Next to it volunteers will help with the campsite daily maintenance: lawn mowing, trimming, repairing infrastructure, planting the trees etc. Tasks might involve some construction work and any other campsite related activities. Our volunteers will gain hands on experience organizing activities, summer camps, team work, improve scouting skills and many more valuable skills for life! It will never be the same routine, you will have to be flexible and ready to adapt to the fast changing situations, different groups and coming up activities. Volunteers will live in Ukmergė, 15 km away from the campsite. A car will be available for daily use. Get ready to spend lot of fun time camping with scouts, working in a team, exploring the country and enjoy the nature! The application form needs to be sent to nocrich@scout.ro until the 15th of January 2016.